Microsoft’s harbors are still mined with Steve Ballmer’s bombs. Paying more than $2 billion for Minecraft’s Swedish maker looks like something from the playbook of Chief Executive Satya Nadella’s predecessor. Using cash to attract attention and users to Microsoft’s hardware is so 2006. Better to focus on its leading businesses, not distractive gadgets. Minecraft may be a great game, but even its creator admits he got lucky. Its parent Mojang had sales of just under $300 million and profits of $115 million last year, according to the Wall Street Journal. At the mooted price, Microsoft would be paying about seven times trailing revenue and about 20 times profits. On financial terms, that’s a hefty price, as Microsoft will probably only have a few years to earn an adequate return. Games companies tend to be one-hit wonders, as the experiences of Zynga, Rovio, and King Digital suggest. The fact Microsoft is using cash trapped overseas helps, but this deal can only be justified if it creates broader strategic benefits. Buy Mojang, and Microsoft can sell the game in its online store. That’s perhaps useful in driving more traffic, which may result in people buying other Microsoft products while there, such as high-margin office productivity software. Moreover, Minecraft isn’t available on Windows phones. Making more content available for the company’s mobile devices might encourage a few more people to buy them. That may be the rationale, but the odds are low Microsoft will succeed. Its share of the smartphone market is below 5 percent. Small developers have little reason to build programs for so few users, giving customers few incentives to buy Microsoft products. Buying one hit kids’ game doesn’t come anywhere close to solving this chicken and egg problem, given the accelerating strength of Google’s Android platform and Apple’s iPhone ecosystem. This all harks back to Ballmer’s vision of Microsoft everywhere. That resulted in many deals and capital squandered. Nadella seemed to be stepping off the path of Microsoft being an all-encompassing tech company. He publicly jettisoned the description of Microsoft as a “devices and services” company and has played up its cloud and enterprise software capabilities. 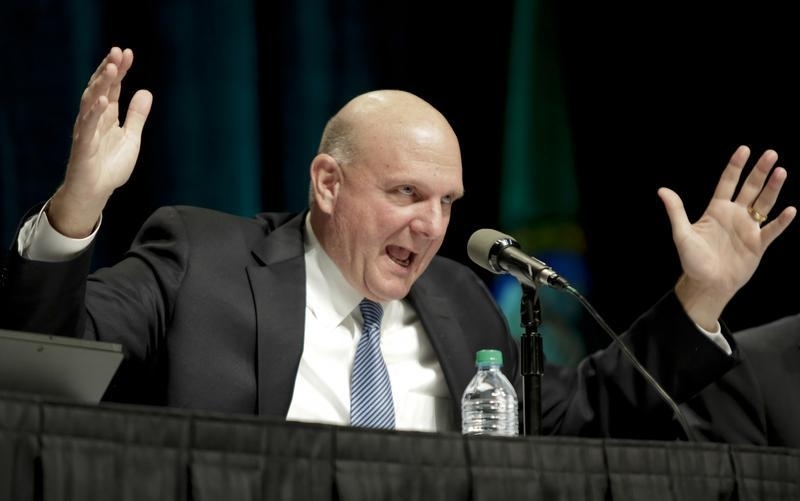 Investors have signaled their support – the stock is up nearly 50 percent since Ballmer announced his decision to resign just over a year ago. Nadella has no reason to backtrack. Microsoft is in talks to buy Mojang, the maker of popular game Minecraft, for more than $2 billion, according to The Wall Street Journal. The Swedish company had revenue of about $291 million last year, and profit of $115 million, according to the article.